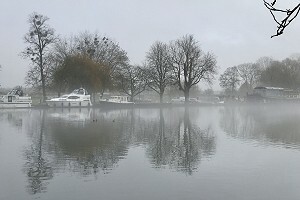 Sunday 8th January didn't look promising as we gathered in Hurley for our first walk of the year. It was raining and the journey to the starting point had been along wet roads, thick with spay. Nonetheless, eighteen of us turned up and the rain stopped at 10:30 just as the walk started. A nineteenth person turned up just after we set off but easily managed to catch us up. 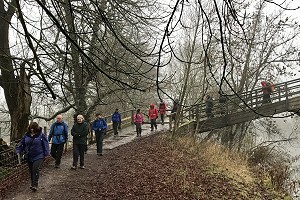 The first section of the walk crossed the River Thames at Hurley Lock and followed the Thames Path eastward as it passed the lock and crossed back onto the Hurley side of the river. After the rain had stopped, a mist seemed to linger over the river. We soon left the Thames Path, just before the next bridge over the river, and headed south and then west back towards the High Street in Hurley, not far from when we started. Following the High Street southward, we crossed Henley Road and began to climb Prospect Hill on a steep and slippery footpath. At the top, we followed the footpath that skirted High Wood and headed toward the Berkshire College of Agriculture. Not much of a view from Prospect Hill today. Here we met a diversion that took us on the road through the college. 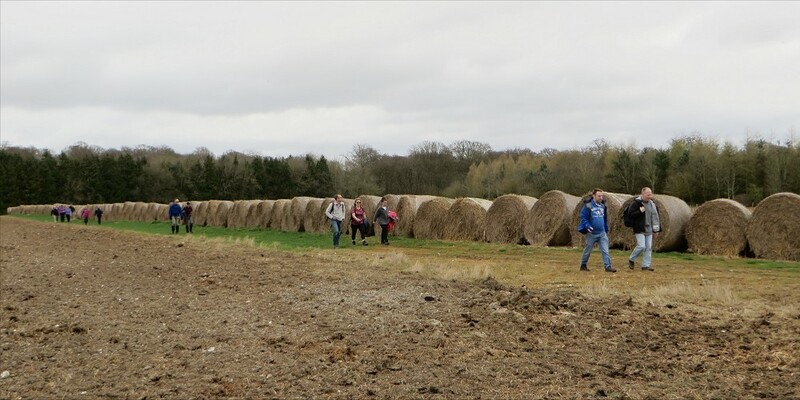 Leaving the college, we crossed a field into Burchett's Green before joining the Chiltern Way, heading west and up Ashley Hill. We stopped off for our picnic lunch in the woodland at the top of the hill before descending on a steep and muddy path. At the bottom of the hill, we left the Chiltern Way and joined the Knowl Hill Bridleway Circuit, which took us north and back to the Henley Road. Descending Ashley Hill after lunch. Crossing the road, we followed another footpath that took us past Frogmill Farm and then through someone's front garden, back onto the Thames Path. This we followed eastward, until we reached Hurley, where we had started. See our route on Google Maps. This walk was a repeat of a walk that Sue had led for us before, but the route was noticeably different due to a number of footpath diversions and because it didn't include Warren Row. Last time we did the walk, we stopped at a pub here, which has since closed down. This time had a pub stop in Hurley after the walk. Walking through Burnham Beeches, on the way to Farnham Common. The weather forecast for Saturday 14th January was for a cold but clear day. I even packed my sun-glasses. Instead it was rather grey when twelve of us met up outside the café at Burnham Beeches. 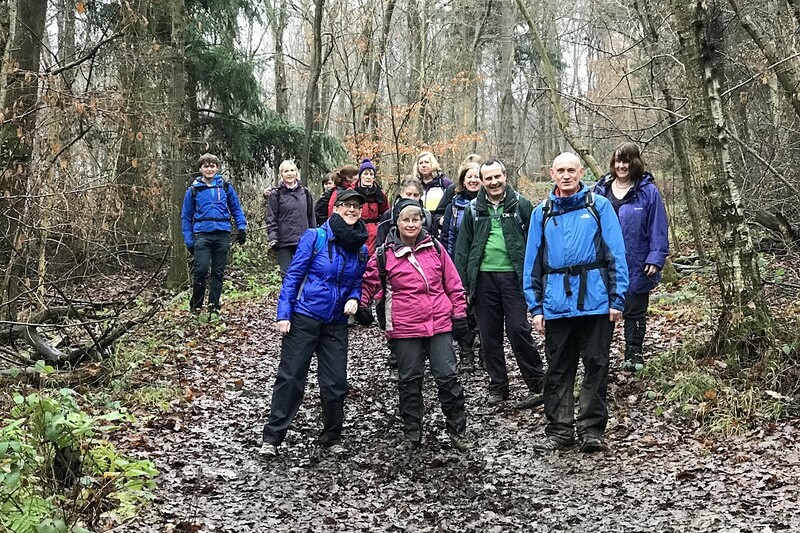 We set off, heading west and then north-west, along a woodland path before taking another path heading north-east, towards Farnham Common. This brought us to the edge of the woods and on to Egypt Lane. Briefly we followed the lane northward before leaving it for another woodland footpath, heading north-east again, towards Hedgerley. 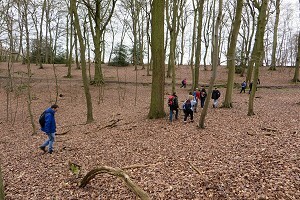 Walking through Egypt Woods, between Hedgerley and Littleworth Common. There was still no sign of the sun as we crossed Court Farm near Hedgerley. In fact a light rain began to fall. 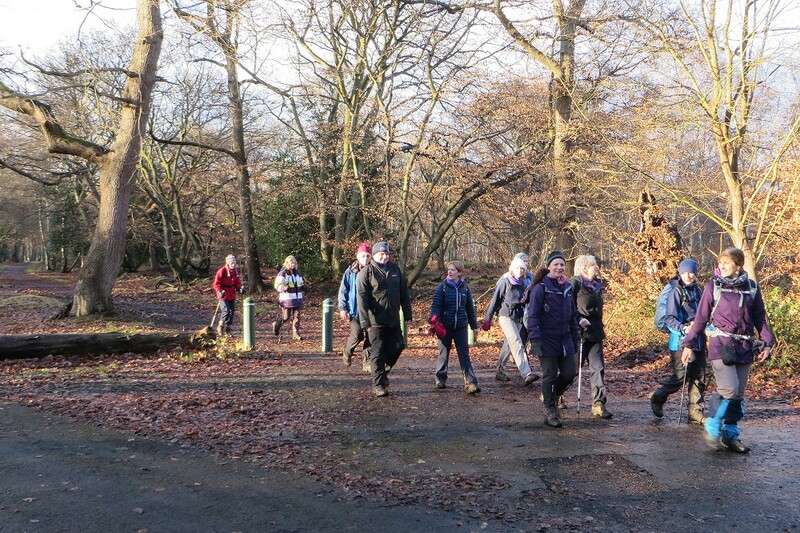 We continued our route through fields and woodland as we looped round Church Wood, Leith Grove and Hedgerley Green. We stopped to eat our packed lunches on a bank at the side of the footpath, not lingering too long as the rain was starting to get a bit heavier. The next stop was the White Horse in Hedgerley. There was a marquee at the back of this lovely old pub, complete with some patio heaters, so we were quite cosy there. They were also serving mulled cider and other hot drinks. Guess what I had? Walking through Burnham Beeches on Shakespeare's Way. We followed this long-distance path for a short distance (2 miles) heading south-eastward through Dorney Wood, back into Burnham Beeches and to the café where we'd started the walk. See our route on Google Maps. And they're off! BWWs running down the straight mile. 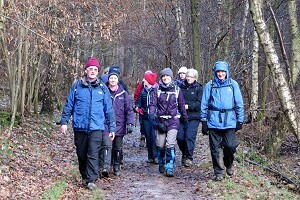 Eight of us turned up on Saturday 28th January for a short (six mile) walk followed by a pub lunch. We met outside the Duke of Edinburgh on Woodside Road, near Ascot, for a 10 o'clock start. We set off along Kiln Lane, which soon became a footpath leading through farmland and bringing us out onto the A330 at the northern-most tip of North Ascot. An alleyway between shops took us onto the B3034 Forest Road, which we followed to a crossroads with Coach Road. 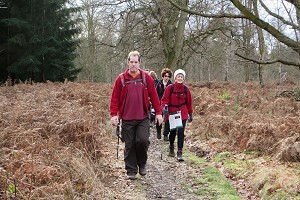 This we followed, leading us back into North Ascot. 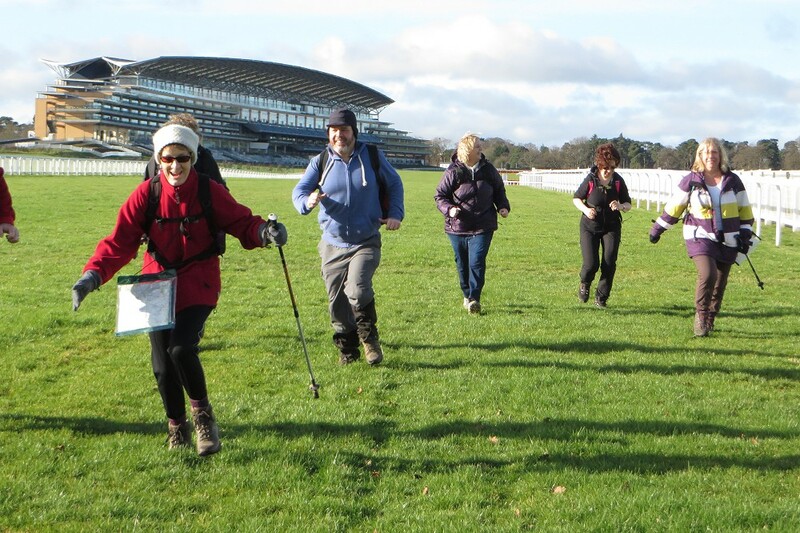 We joined the Three Castles Path, just as it reached the Kennel Gate of Ascot Racecourse. 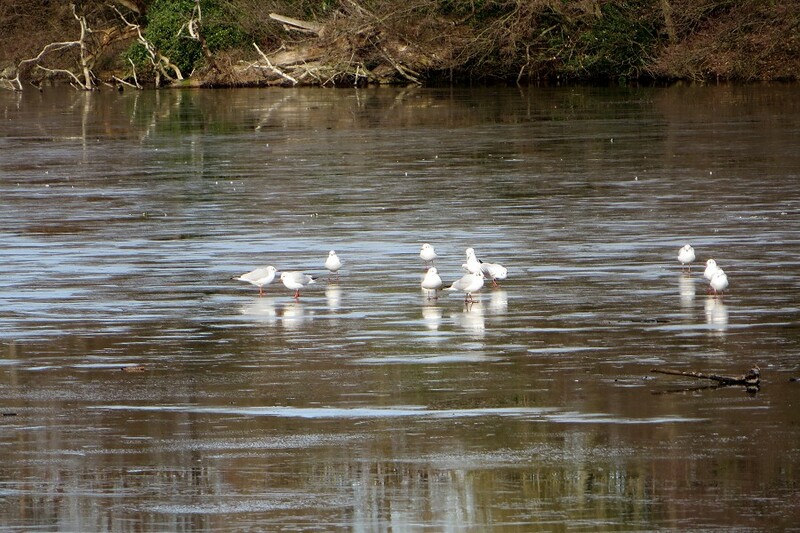 Gulls walking on the frozen surface of the Great Pond. We passed Royal Ascot Cricket Club, which is on the land in the middle of the racecourse, and then went under the racetrack before crossing the 'straight mile'. Our leaders had been told by a local man walking his dog there, that it was possible to walk down the 'straight mile' and exit the racecourse at the end. We soon discovered this wasn't true and had to double back, but we had a little running race of our own, just to test the track. Walking through mixed woodland at Wood End, near Ascot. After our little diversion, we rejoined the Three Castles Path, which followed a footpath parallel to the 'straight mile' and brought us out onto Cheapside Road. We left the road, continuing to follow the Three Castles Path into mixed woodland before leaving it for another footpath, taking us to Great Pond. 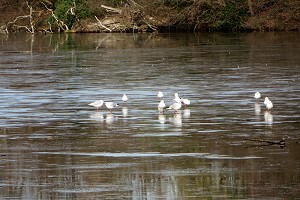 Large parts of the surface of the pond were still frozen from the recent cold spell and birds were walking about on it. Passing the pond on a footpath that took us through Paddock Wood and then Wood End, we emerged onto the A332 near the Loch Fyne restaurant. Crossing the road, we soon joined Woodside Road, which took us back to where we'd started, with plenty of time to change out of our muddy boots before going for lunch. See our route on Google Maps. Seven of us stayed for the pub lunch, and were surprised to meet the comedian Tom O'Connor in the pub. 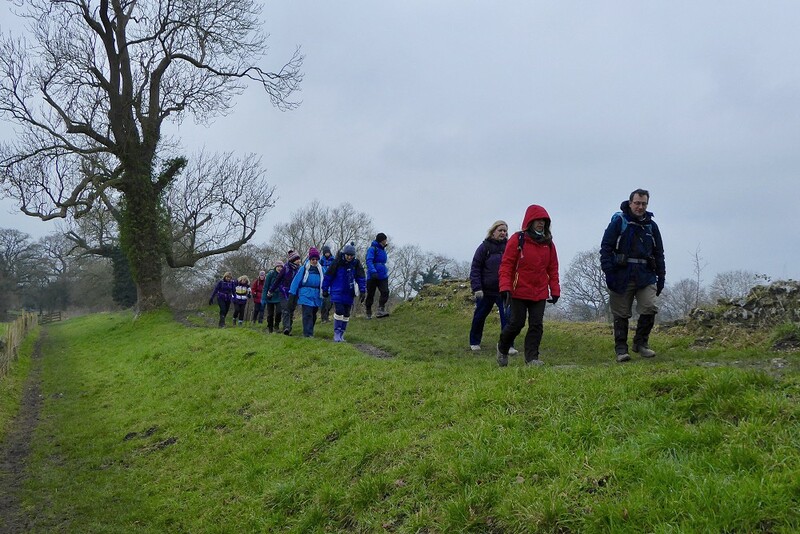 Walking along the north wall of Calleva Atrebatum. 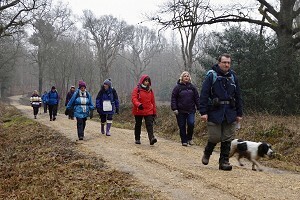 Sunday 12th February was cold and dull, but nonetheless we had thirteen people and a dog turn up for this short walk. 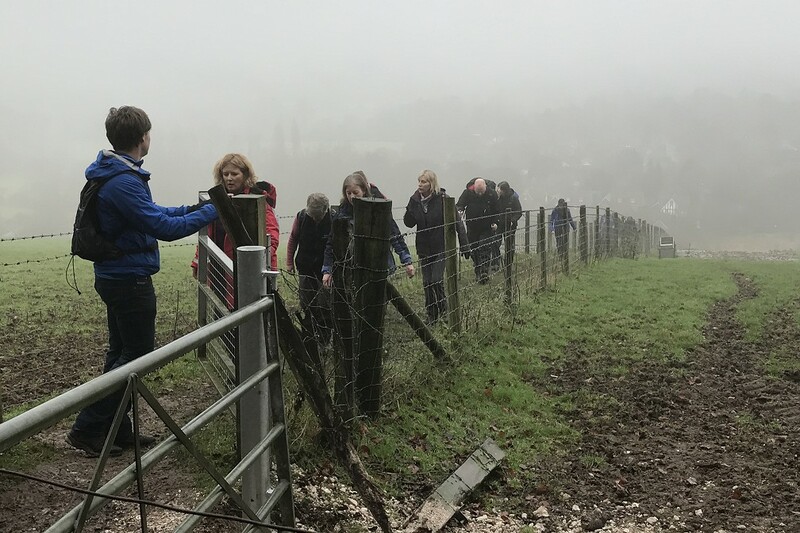 This included two members of the Windsor and District group, and a couple who were visiting family members of our group who had persuaded them to come along. Starting from the English Heritage car park in Silchester, we made our way to the West Gate of the Roman town of Calleva Atrebatum. There isn't much left of this 2000 year old settlement apart from the sturdy city walls. 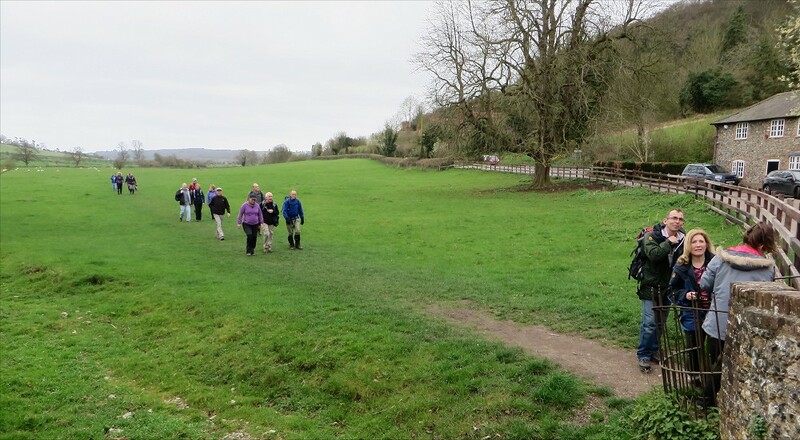 We followed a footpath along the top of the north wall, stopping at the North Gate to look at an information board with an artist's impression of the ancient town. Looking at the information board by the North Gate. As we approached the East Gate, we took a detour to look at the Roman Amphitheatre, which is just outside the city walls. The floor of the amphitheatre is well preserved but the surrounding earth embankments that would have held the terraced seating are now overgrown with mature trees. We entered the East Gate and took a direct path across the middle of the town, which is mostly farmland now, to reach the West Gate, where we had come in. 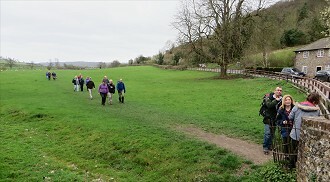 From there we left Calleva Atrebatum on a footpath crossing several fields. At one point we saw some deer leaping through a field ahead of us. The dog didn't see them but when we passed through that field, he was sniffing away at their trail. A well maintained path through Pamber Forest. Emerging from a field onto Byes Lane, we followed it for a short while before taking a footpath into Early Bridge Copse and Bridle's Copse. 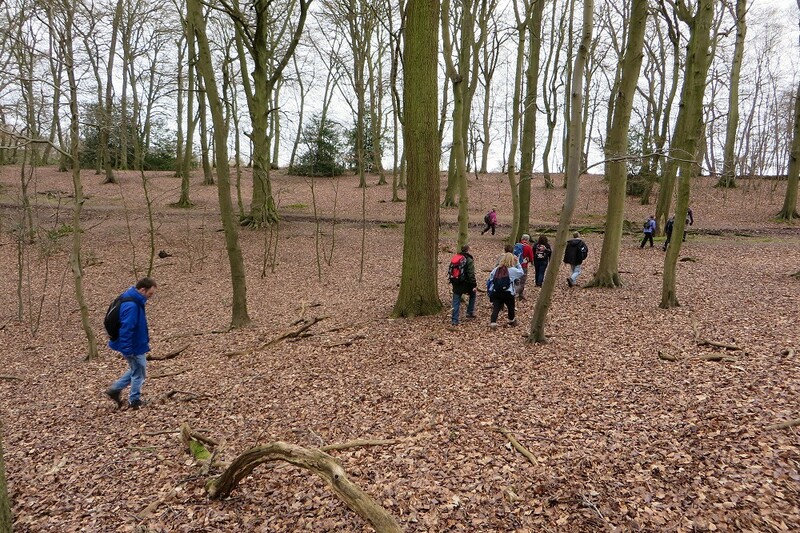 We were now in the woodland surrounding Pamber Forest. 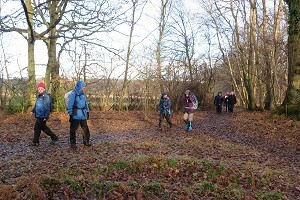 We crossed Silchester Road and entered Gravel Pit Copse, where the paths were very muddy. We entered Pamber Forest on a well maintained path and soon found a nice spot to stop for our picnic lunch, complete with logs to sit on. After lunch we continued on a square loop through the forest, leaving the well maintained path for the more muddy footpaths of the Brenda Parker Way. Some handy duck-boards over a particularly wet bit of Pamber Forest. 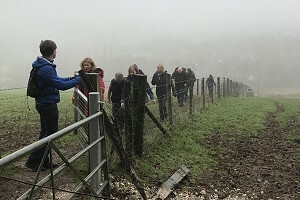 This recently opened long-distance path, named after a walking enthusiast who has done much work to maintain rights of way, crosses Hampshire from Andover to Aldershot. We would only follow a couple of miles of it today but we have followed other sections of this long-distance path on several previous walks. 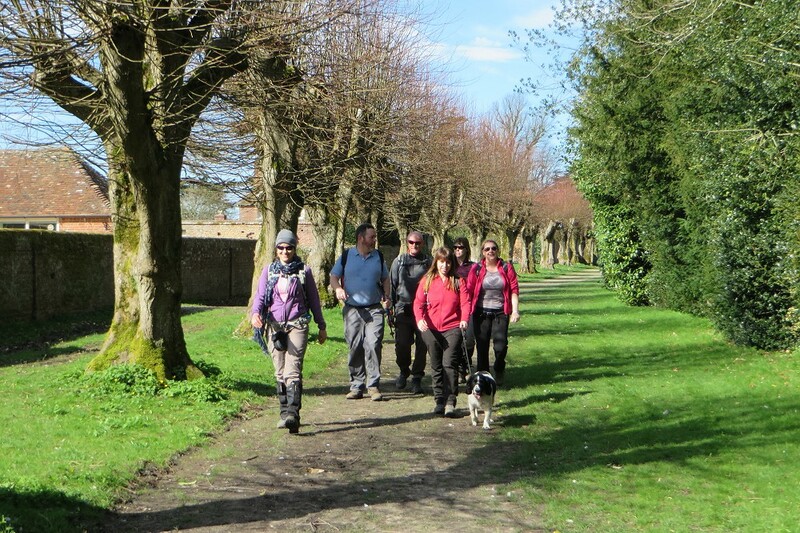 A gentle uphill section of muddy footpath brought us into Silchester village by the Calleva Arms pub. 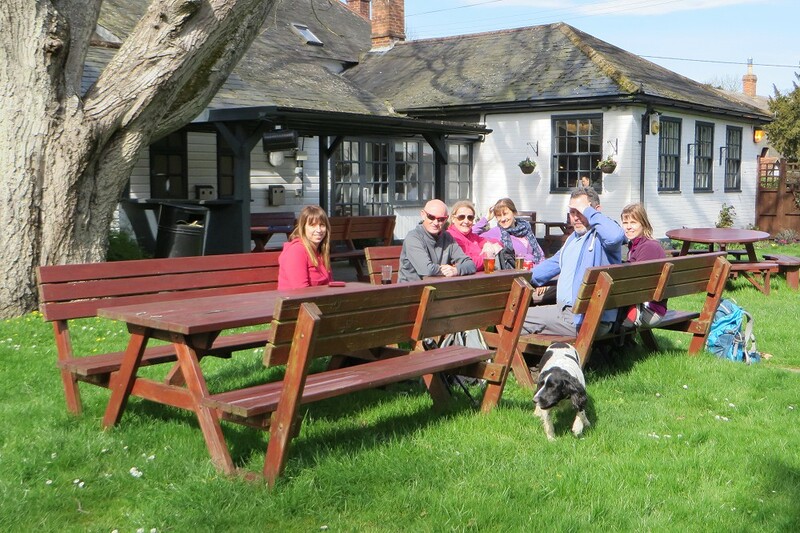 Here we stopped for a drink before finishing the last mile of the walk, which continued to follow the Brenda Parker Way back to the Roman remains before heading back to the car park. See our route on Google Maps. 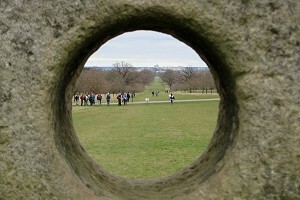 Looking through the Millstone Memorial on Queen Anne's Ride, towards Windsor Castle. On Sunday 26th February, twenty one walkers (including the two walk leaders) gathered to walk in Windsor Great Park. The weather forecast was for dry and cloudy weather, but as we waited for walkers to get ready we had a touch of rain. Luckily the majority of the walk was dry. 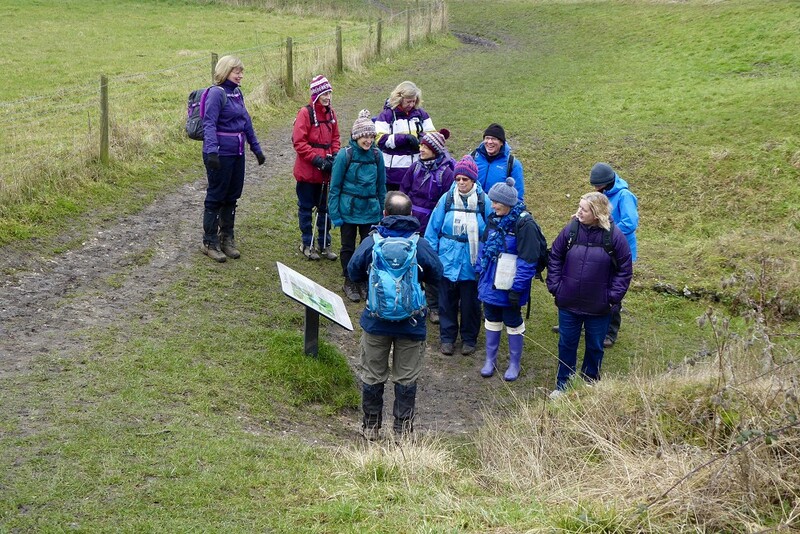 We originally planned to meet at Cranbourne Gate, but on learning that two other walking groups planned to start their walks there we changed the start of our walk to Ranger's Gate. Unfortunately we competed for parking with horse boxes, as well as one of the walking groups who started at Ranger's Gate rather than Cranbourne Gate!!! Eventually we all found parking spots, but we were a little later than planned starting the walk. 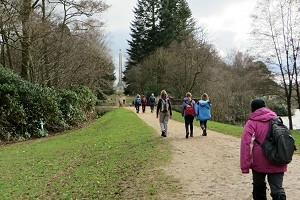 Approaching the Cumberland Obelisk on the way to the Savill Garden. 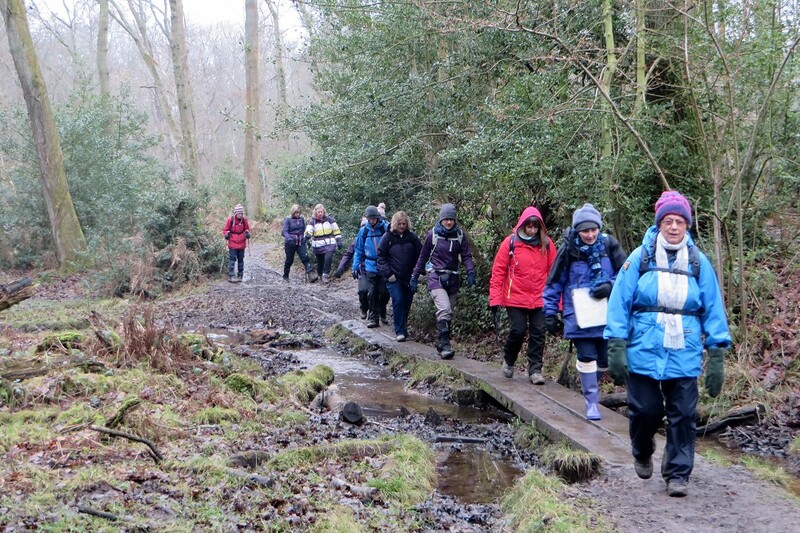 Joining us on this walk were three new walkers, as well as a very experienced walker from another group, who also had an excellent knowledge of Windsor Great Park, and he shared some interesting history along the way. From Ranger's Gate on tarmac paths we headed round the back of the village, past Prince Consort Workshops and the Millstone in Queen Anne's Drive. We then turned up Duke's Lane adjacent to Queen Anne's Walk. At the top were excellent views down to Windsor Castle. The variety, shape and colour of the trees, although bare of leaves, were enjoyable to see. 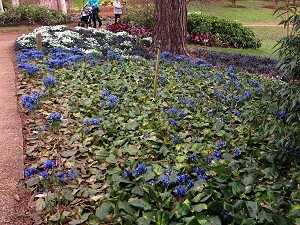 Plenty of colour in the Savill Garden. Leaving the main paths we took a bridal path through the woods on slightly muddy tracks and we emerged at Virginia Water. 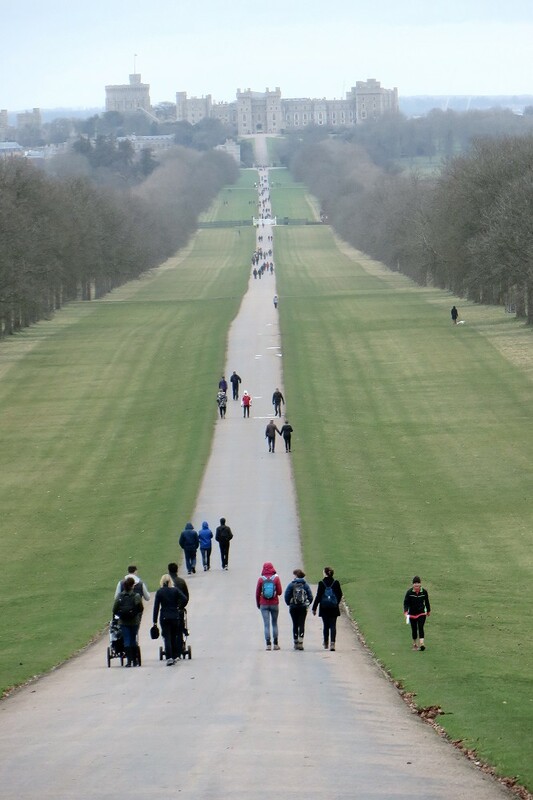 Then onto good paths to Smith's Lawn, passing Valley Gardens, the Polo Ground and Prince Consort's statue on the way. 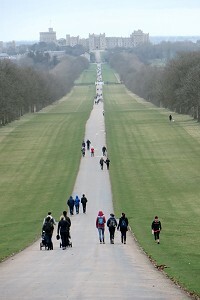 Looking down the Long Walk, towards Windsor Castle. On the advice of our expert of Windsor Great Park, we took an alternative path to Savill Garden with the grand view of the Cumberland Obelisk ahead. 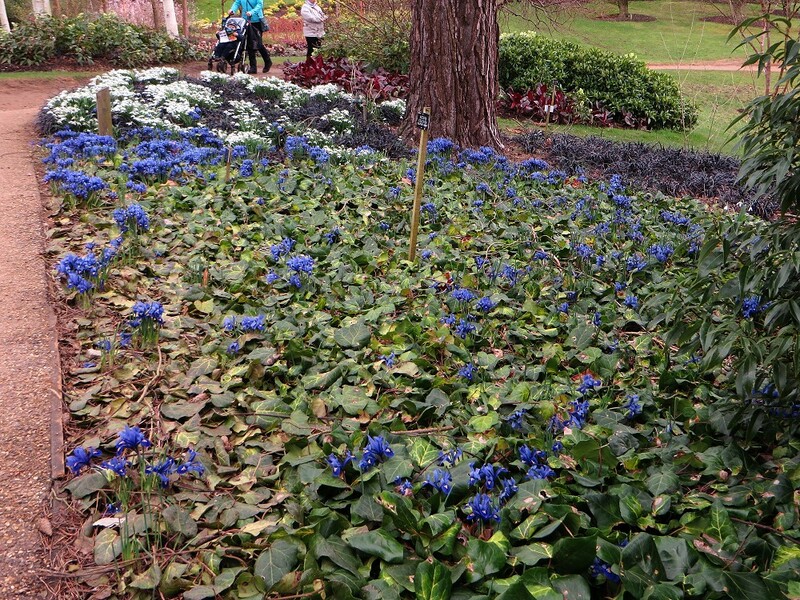 We reached Savill Garden for an extended lunch-stop, allowing time for refreshment at the café, visit the shop, WC facilities and walk round the gardens, which are free until end of February, with much to see with some striking colours and early spring blooms. Following our break we walked on to Bishopsgate and the deer park. We then passed the Copper Horse statue which also affords the best views down the Long Walk to the Castle. 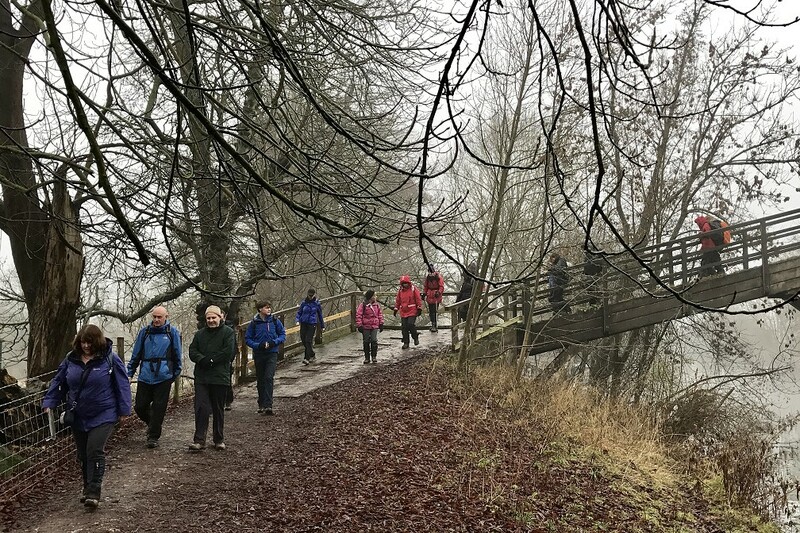 We took a different path through the village to the Royal Post Office, which unfortunately was closed (we had spent a lengthy time at Savill Garden) before returning back to the car park at Rangers Gate. See our route on Google Maps. Thank you to Ann and Kathy for leading this walk and to Ann for writing it up. Approaching Hambleden from Mill End. On Sunday 19th March, we had twenty walkers congregating at the end of Ferry Lane, Medmenham. 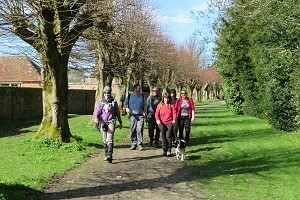 We started by following the towing path on the north bank of the River Thames westward until we reached Hambleden House. Here the path left the river's edge and took us to Mill End, where we headed north to Hambleden on the footpath that runs parallel to Skirmett Road. Stopping in the picturesque village of Hambleden, some of us made use of the coffee shop at the Village Store while others availed themselves of the toilet facilities at the Village Hall. Church of St Mary the Virgin, Hambleden. 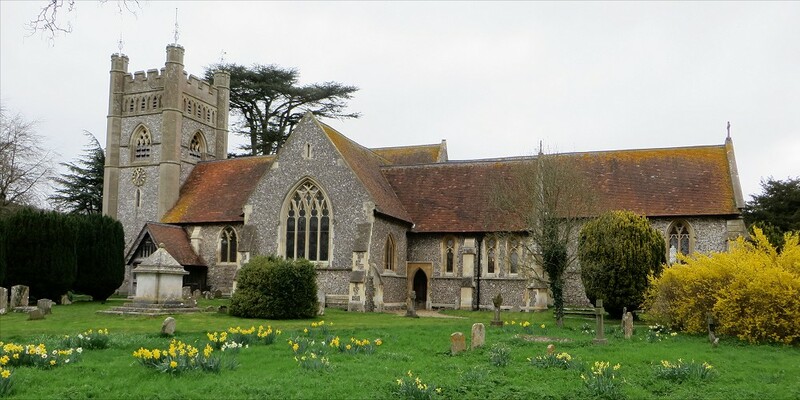 The daffodils where out and added a splash of yellow to the church grounds. Soon we were on our way past the village butchery, pub, manor house and sports field, following Shakespeare's Way eastward out of the village. 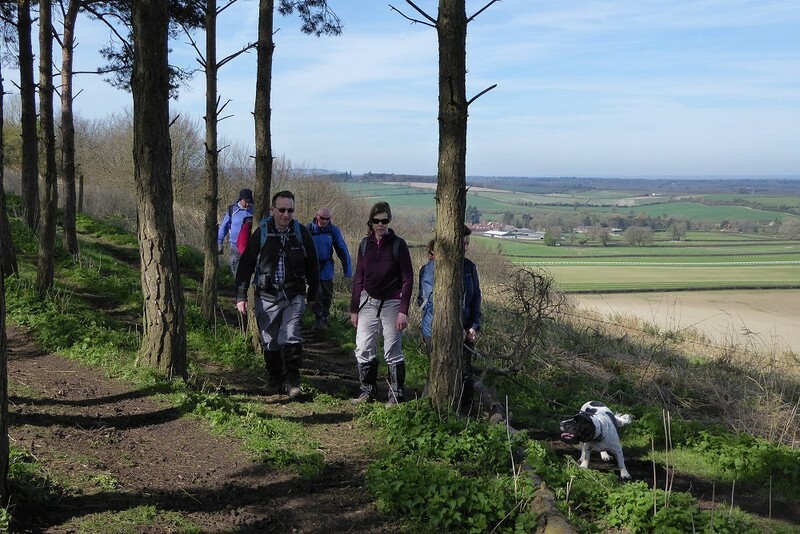 We left Shakespeare's Way just as we reached Rotten Row, and headed south through Harcham's Wood, across fields and along a quiet lane into Chalkpit Wood. Here we stopped to have our picnic lunch, making use of a couple of large fallen tree trunks. We've been quite lucky recently in finding handy places to sit for lunch. 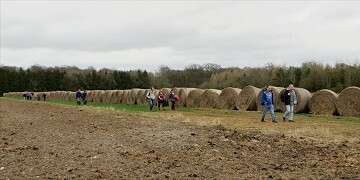 Passing a row of hay bales on part of the Shakespeare's Way. 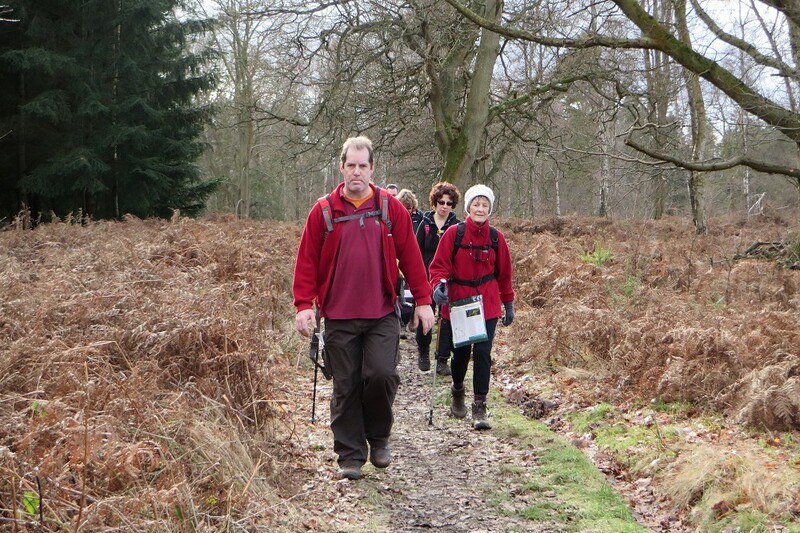 Once our packed lunches had been consumed, we continued onwards and downwards through Binfield Wood, emerging onto the A4155 Marlow Road, just outside Medmenham. Crossing the road, we followed a footpath that took as on a slightly less direct, but quieter route to Medmenham and the Dog and Badger pub. Well, of course we stopped for refreshment. The pub has been completely refurbished since my last visit and is now decidedly up-market. Nonetheless, they had several local ales on tap and plenty of outside seating. Walking through Hollowhill Wood, near Danesfield. On leaving the pub, a couple of the group took advantage of being so close to our cars and left early. 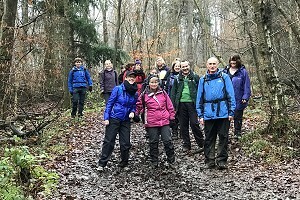 The rest of us were immediately faced with an uphill footpath through Millbank Wood, Hog Wood, then Hollowhill Wood and finally Rassler Wood before crossing the A4155 again near Danesfield. We then headed back down to the River Thames, passing Danesfield Hotel. 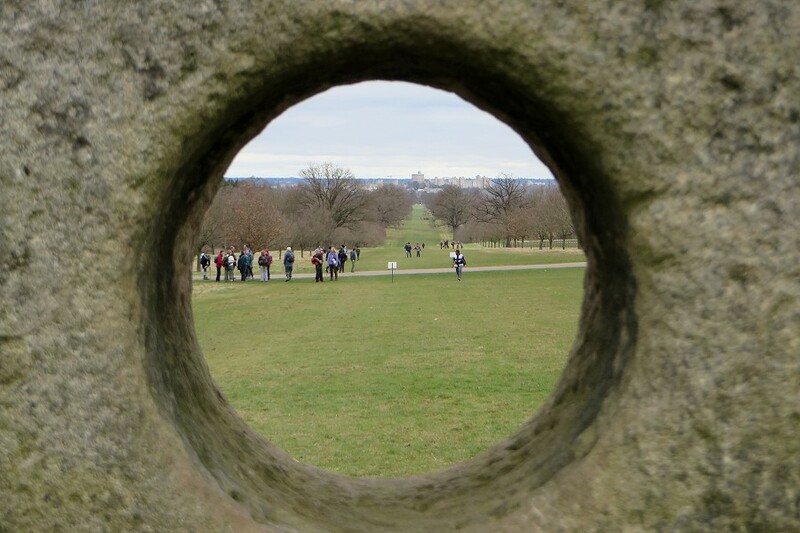 This involved passing through a tunnel built to prevent commoners from spoiling the view from the 'big house'. The path soon diverged from the riverside and crossed a couple of low-lying and rather boggy fields before returning us to Ferry Lane, from where we'd started. See our route on Google Maps. Cottington's Hill with a view of Park House Stables in the distance. 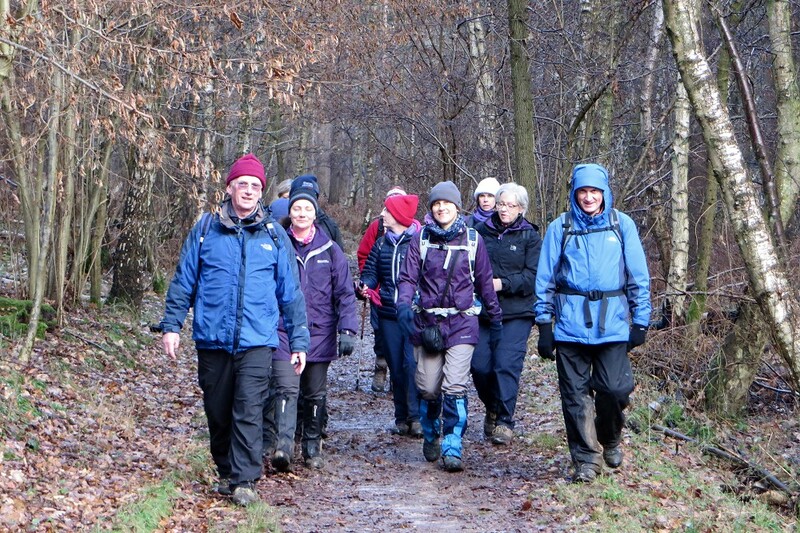 We haven't had a walk on a Saturday for a while so I put this last-minute programme entry on Saturday 25th March. Also Sunday was Mother's Day and I thought people might be busy then. This walk was a repeat of one I'd led in February 2014, but with a slight modification to lengthen the route a little bit. Seven regulars (plus a dog) started at the free car park on White Hill and made our way up Cottington's Hill. Skirting the woods along the top of Freemantle Park Down, we then descended on a track (Hollowshot Lane) towards the village of Kingsclere and Park House Stables. We crossed Swan Street and Fox Lane before joining a footpath that is part of the Brenda Parker Way. Stopping for a drink at The Royal Oak in Ecchinswell. Cottington's Hill, Watership Down and Ladle Hill were clearly visible from this path before it turned north toward Frobury Farm and its fishing lakes. We saw a few fishermen as we passed the northernmost lakes on our way through Frobury Park Copse and into Southwood Copse, where we stopped for our picnic lunch. As ever, a fallen tree made a convenient bench to sit on. After lunch, we continued to follow the Brenda Parker Way westward toward Ecchinswell. Leaving it as it turned north, we crossed a stream and followed a woodland path into the village. 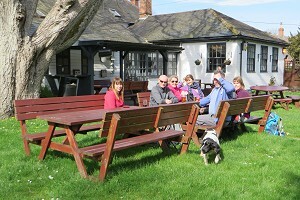 We walked down to the Royal Oak pub and sat in their garden enjoying liquid refreshment and spring sunshine. Walking through the Sydmonton Court estate. We left the Wayfarer's Walk as it passed the car park where we had started. See our route on Google Maps.